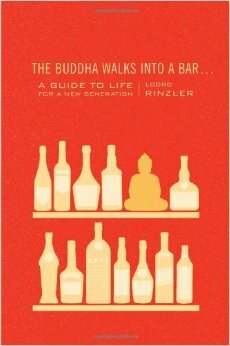 I recently started reading The Buddha Walks Into a Bar by Lodro Rinzler and I’m obsessed. The author presents abstract concepts in an understandable fashion and gives you the opportunity to apply Buddhist principles to your life in a very realistic way. Teaching yoga has truly brightened my life in so many ways and I am so grateful, but there are times when I question my own worthiness. I do my best to apply the same yogic principles that I teach to my own life, but I’m only human and sometimes I struggle with them too. I get frustrated and have to wrangle my temper back in. I stub my toe and curse the thing I tripped over. I mindlessly eat late night snacks in bed. I have terrible road rage at times. Does this make me unfit to teach yogic theory? I used to think so. These qualities once made me feel like a bad person or someone not suited to teach yoga, but I am beginning to learn that such actions and reactions are all a part of me discovering who I really am. Being mindful of these occurrences is what allows me to grow and develop an understanding of myself and my relation to the world around me. In his book, Rinzler elaborates on the idea of being precise, gentle, and discerning (qualities of the tiger) during day-to-day life without compromising your own integrity. By applying these principles we are able to release our attachment to any particular outcome and accept what is, right now. The metaphorical spoon refers to an analogy used in the book which demonstrates how we take a simple thought and develop it in our mind to create a web of possible scenarios. Rinzler pictured a clear glass of water (our still mind) and dropped a clot of dirt (a thought) into the glass. The spoon stirs the dirt and it begins to cloud the water, just as a simple thought can consume our mind when we imagine various possible outcomes from the situation. When we remove the spoon and allow the dirt to settle, we return to our original clarity. Methods for removing the spoon, which is not easy by the way, can include simply returning your focus to your breath. I have found this to be most useful and when I encountered a situation which I found to be overpowering, I returned my attention to what was happening within me. It gives me a sense of security to know that I can always retreat to the still sanctuary within and allow whatever is happening outside to happen.